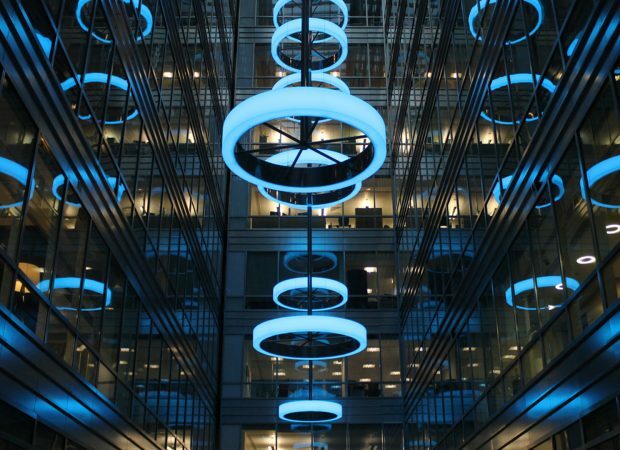 A stunning new bespoke lighting feature in the atrium of commercial offices at Broadgate Quarter in The City; concept and lighting design by John Robertson Architects and Cundall – manufacture and installation by The Light Lab. The installation took place over a 6 week period, using our specialist installers, working alongside a team of abseilers to ensure that each bespoke halo structure was installed as designed. 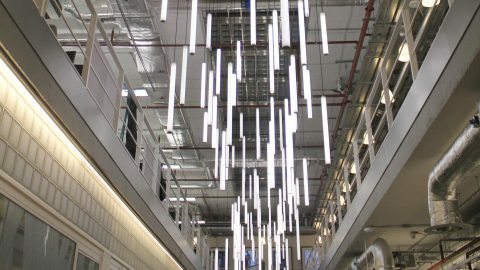 This is The Light Lab’s largest atrium lighting project to date, with the installation reaching almost the full length of the 50 metre atrium. 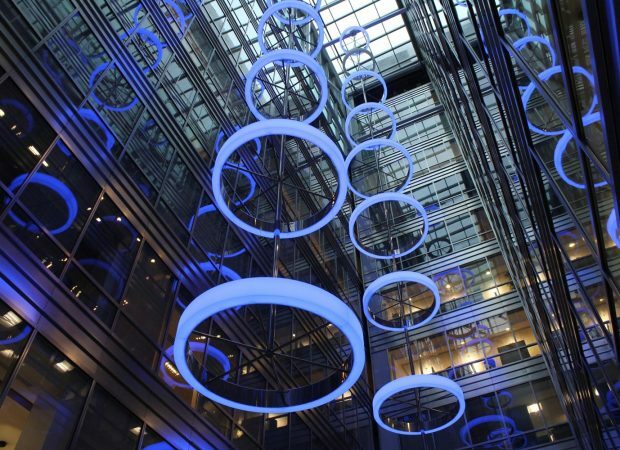 Working to the detailed concept design of lighting designers Cundall & JRA, we initially produced a full scale mock up, comprising of one complete illuminated ring that we winched to the top of the atrium for the design team review. 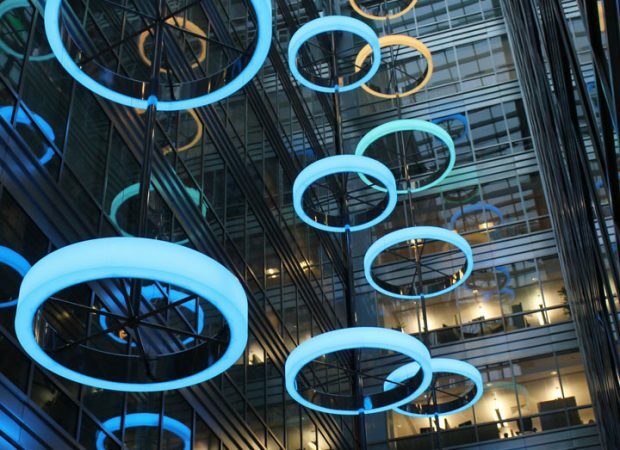 When tackling the full project, the main design challenges for us involved the structure of the feature; particularly the balance of providing sufficient strength to each illuminated ring whilst ensuring there was no visible shadowing. Whilst at the same time there was the requirement of a very light-weight structure to fix to the existing atrium support beams. The final design was approximately 750Kg per chandelier (including all cabling) which for a 45m long structure was a considerable design challenge. The cabling alone was a sizeable task requiring the running and managing of over 1km of cabling of sufficient size to ensure all LED rings were consistently and evenly illuminated. Andrew Bissell from Cundall, speaks of the close working relationship between the designers and The Light Lab, to ensure the installation ran smoothly and was completely true to the design. 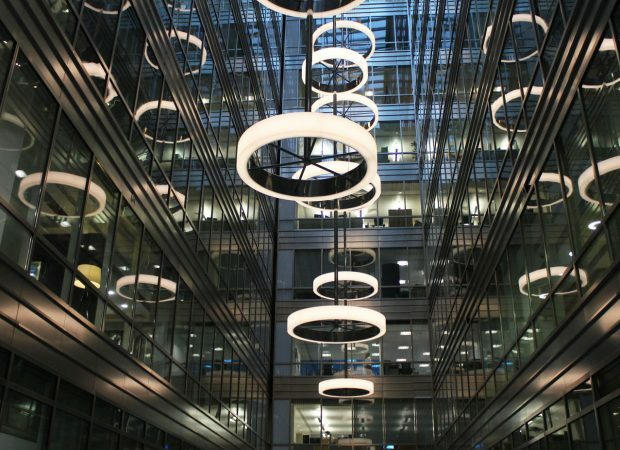 “Having designed such a large lighting element to fill the atrium space, we needed to be sure the design intent was retained through the construction detail and installation process. The Light Lab understand the importance of even the smallest of details and how to manage and undertake an installation of this nature. As such the client has the lighting effect originally presented along with a high quality and low maintenance product and installation”.